A man makes his way past a house badly damaged by a tsunami in Sumur, Indonesia, Dec. 24, 2018. The death toll from Saturday's tsunami in Indonesia rose to 373 Monday, according to disaster management officials. ​The casualties occurred in three regions — South Lampung in Sumatra and the Serang and Pandeglang regions of Java, west of the capital Jakarta — along the Sunda Straits, disaster agency spokesman Nugroho said in a statement. A tsunami survivor sits on debris as she salvages items from the location of her house in Sumur, Indonesia, Dec. 24, 2018. The Red Cross said Banten is one of the "worst affected areas". 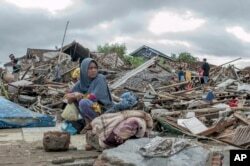 The aid organization, however, said it was able to dispatch "relief goods" from its Banten warehouse, including water, tarpaulins, cleaning equipment, plus family and hygiene kits. As did United Nations Secretary-General Antonio Guterres. His spokesman said the U.N. chief was "saddened by the loss of life, injuries and damages caused by the tsunami" and that the world body "stands ready to support the ongoing Government-led rescue and relief effort."